Sign up now for JNF UK’s Beit Uri Golf Mission! A perfect opportunity to combine a love of Israel with a love of golf. 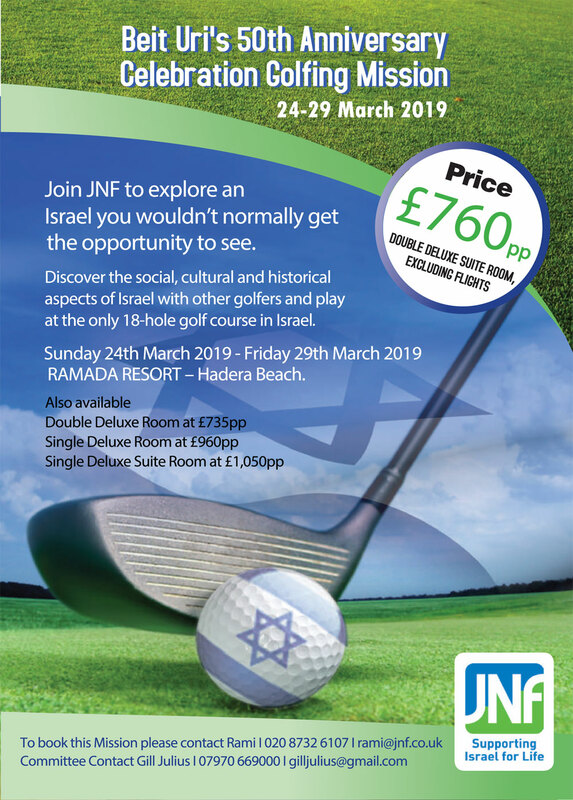 This six day trip runs from the 24 – 29 March 2019 and will take in cultural sites, visits to JNF UK projects, group meals and – of course – plenty of golf! Staying at the spectacular Ramada Resort Hotel Hadera Beach, the Golf Mission will travel into the Negev to witness the stunning scenery and get a first-hand glimpse into the lives of the many people JNF UK has helped over the years. Following a day of golf on Israel’s only 18 hole golf course, the Golf Mission will spend another day visiting Beit Uri – an inspiring project which provides a welcoming home for the mentally and physically disabled, and the focus of many JNF National Golf’s fundraising efforts. More golf to follow on the next day, and then the trip concludes with a farewell party and a prize giving ceremony.